Today everything is mobile including real estate. 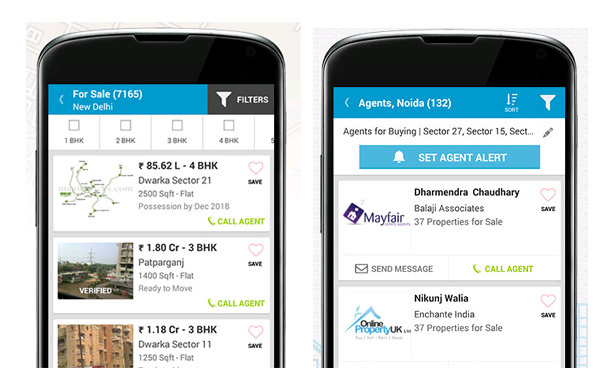 Yes now you can find property on the go by using real estate app on smart phone. If you are hunting for good property within your budget these real estate app will surely help you to narrow down your search. These real estate apps will also help you to know prevailing property rates at nearby locations. Here are 10 Best real estate app for your android smart phone. You can download these apps from google play store. Common Floor is top real estate website of India. Real estate app “Common Floor Property search” by commonfloor brings best real estate deals on the mobile. This real estate app gives freedom to find property for buy, sell and rent on the move. This app also includes map search facility. You can filter property by defining size, amenities, bank approvals, rates, nearby facilities etc. You can share property details with friends, relatives. It also allows you to post your requirement related to real estate. “99acres real estate and property” is free app for searching property across India. This app offers rich photos, attractive videos and interactive maps for all kind of properties. This real estate app offers map view along with nearby amenities such as market, ATM, garden, airport, school, restaurant, shopping mall, railway station etc. This app allows you to send SMS/E-mail to property advertiser for free. MagicBricks leading real estate portal of India offers property search on the move with mobile app called as “MagicBricks Property Search”. Apart from refining search this app also offers facility to create email alerts to get matching properties automatically. You can save and access properties and projects for future reference. This real estate app also offers facility to read latest news pertaining to real estate domain. Sulekha is multipurpose app which will not only help you to find property it will also help you to find local services including business, education and job listing. This app provides very good set of filter when it comes to your real estate requirements. It contains integrated option to contact advertiser. 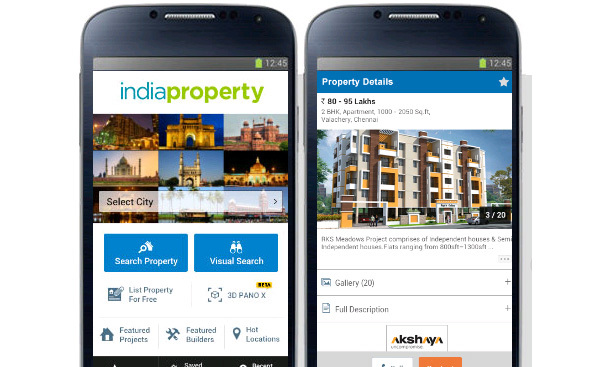 India Property app allows you to search over millions of property listing for sale or rent across the India. This app contains unique feature called as “Property Lens”. This feature helps end-user to view map view and list view of property. You can find distance between various properties. It will also help you to get other information about properties. Zillow is leading property portal for US. Zillow real estate app provides facility to search family homes, apartments, condos, town homes from millions of listing. This app can also help you to get pre-approved loan & mortgage rates from trusted lenders. You can get personalize loan quotes from this app. This app offers voice search and map search facility. Zillow helps you to save your search result. This real estate also offers facility to receive notification about publishing of new listing, drop in price etc. Real estate search and discovery is very easy by Trulia real estate app. This app brings built-in GPS facility to search nearby properties. This app provides photo slide show facility. Unique feature about this app is it comes with crime map and cross device access facility. Relator is largest property portal which provides property search facility across 33 countries & 11 languages. 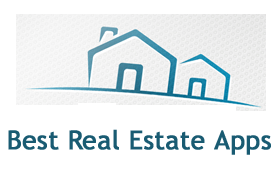 Relator offers multiple real estate apps for sale, rental and mortgage calculations. Relator real estate app is unique where 90% of listings is getting updated every 15 minutes and rest are getting updated at least once a day. This app keeps you updated with true status of real estate and apartment listings including offer price. Century 21 real estate mobile app allows you to search listing across US. Century 21 brings details information about property including price, size in square foot, estimated mortgage, taxes applicable, property features, pictures, directions etc. Home snap is unique real estate app. Just take snaps of property and upload it for buyers on the move. Very user-friendly app. Recommended app for all buyer and sellers. So, what are you waiting for install theses apps on your mobile and explore the world of real estate. If we have missed any app here you are requested to contact us and we make sure it will be listed. If you have already explored this apps do share your experience with us. Should you buy property via real estate website? What is Benami Property? What is prohibition of benami property act?